I’m not sure why, but I have been baking like crazy lately. And I don’t mean biscuits or chicken – I’ve been baking dessert-appropriate stuffs. I’ve been home a lot in the past week. Maybe it’s that. I’ve been trying not to go out and spend money. Maybe it’s that. Fred’s out of town. Could be that. I have also had a windfall of all-things-citrus growing in my canyon. So much so that I don’t know what to do with it all – and y’all know how I hate to waste a thing. Oh, and I have recently just reorganized the kitchen and discovered all sorts of baking-related tools I had forgotten that I had. I guess I thought it would be fun to put them to use – finally. So I guess I’ve answered my own question as to why I’ve been on the baking jag. Let’s see, I think it started with apple crumble muffins last week. I noticed Maggie had some apples in the crisper of the fridge that had gone unnoticed for some time and, I felt, were in dire need of saving. They turned out okay – or so I heard. I don’t eat the cooked fruit, so I didn’t have one. But I heard they were nice and moist. Then I deigned to make my Mom’s lavender cupcakes. I have always loved them. The Portsmouth icing is so sweet and decadent it hurts my teeth (in a good way). That sweetness coupled with the cupcake’s simple, clean lavender-ness work really nicely together. I think. I gave most of those away, too, but I had a few bites here and there. They were delicious, if, perhaps not the most beautiful cupcakes I had ever seen. Then Maggie and I teamed up to make an orange cake. I worked the cake part whilst Maggie worked the fruit part. It turned out all right but not great. We both thought it was a bit dry, but were confident we could get it right next time ‘round. It sure was pretty, though. And we had loads of fun doing it together. Then a couple days after that I found a recipe for a grapefruit pound cake that I had to try. No, grapefruit was not growing in my hood, so I did have to do a little shopping for this one. I’d say this was my biggest success to date. The cake came out perfectly and it looked beautiful. Maggie, who had tasted everything thus far, agreed. In fact, I do believe she’s had at least three pieces already today. Then today, I stumbled upon a recipe for orange-walnut cake. I had some black walnuts from the salad course of the last Dinner at Eight, and clearly I have oranges. Done. But when I needed to grease the cake pan, I remembered Maggie had left it in her car. And she wasn’t home. So orange-walnut muffins it was. I think these guys turned out pretty great. I would do a thing or two differently next time, but I’m not awesome at riffing in the baking department yet and the cake-to-muffin switcharoo at the last minute threw me for a loop. I made so many that I made Maggie take two thirds of them to work with her to share. I’ve been baking something new practically every day for the past week. And nothing has been too shabby either. That makes me feel pretty good about my kitchen prowess. But what’s ironic is that I haven’t been eating any of the stuff I’ve been baking. I’ve just been baking to bake. But you know what I’ve been craving to eat? Oysters. I mean, I always crave oysters, so that’s no shocker. But about six months ago I discovered the bliss that is the Grilled Oyster. I was at Salt’s Cure. Ever since, I order them each time they are on the menu and ooh and ahh before and after every single bite. They are just barely cooked, you see. They still maintain their raw-ness, but not in essence. They are warm and they embody a sultry smokiness. Grilling oysters over high heat really just saves you the trouble of shucking them first, since the intense heat forces the shells open on their own. They are nothing short of magic, I tell you. Then, about a month ago, Fred took me to his family cabin in Inverness for a weekend. I loved it there. Everything about it. But one of the most amazing things that we did was buy a couple dozen fresh oysters from a guy with a stand between our road and the water. We then went back to the house and, though it was rainy and blustery - and now dark - Fred lit the charcoal grill out on the patio. While the coals got going we whipped up a salty, garlicky, lemony, buttery sauce. He put that on the grill in a little saucepan to keep it warm and, as each oyster popped open to tell us it was ready, he yanked it off the grill, forked it out of its shell, dunked it in the butter sauce and popped them into one of our mouths. It was so cold out that steam came out from our faces as we slurped away. All of this with champagne, mind you. Afterward, we went inside and built a fire. Hell, I guess I do miss Fred. So, although you probably thought I was going to share with you a recipe from one of my baking adventures, I am really here to help you to have grilled oyster night all on your own. Just don’t forget the champagne. Heat a small sauce pan over medium-low heat. When hot, add the olive oil and the butter. Add the garlic and sauté until fragrant, about 30 seconds. Add the lemon juice, chili pepper flakes, salt, pepper and parsley. Turn off heat. Scrub oysters under running water; discard any that are open and do not close within a few seconds. If you can find large, fat oysters, you can place the oysters directly on the grill grates. It's best to wear long, sturdy BBQ gloves so you can handle the oysters by hand instead of using tongs, spoons or spatula. However, if the oysters are small and flat, you'll run the risk of spilling its valuable, flavorful juices as well as the garlic-butter sauce. 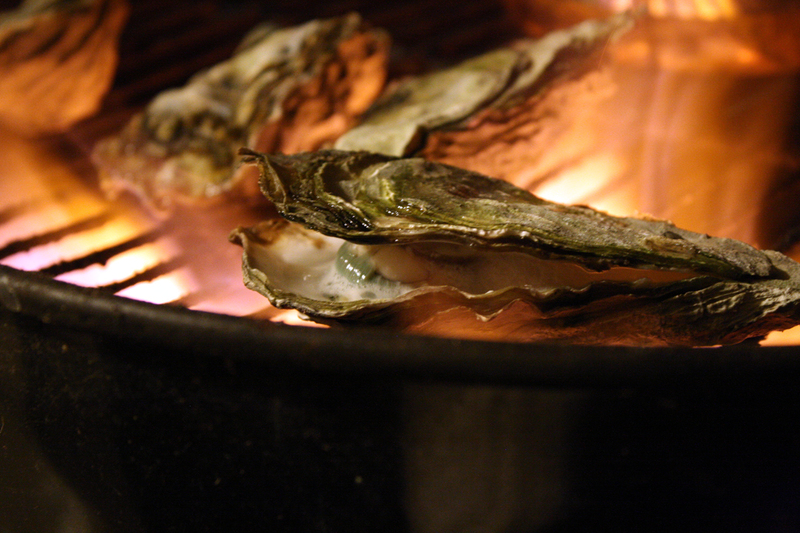 Put oysters flat side-up directly on the grill when coals are pure white hot. Remove with tongs when shells begin to open, about 5 minutes. Place the oysters, cup side up on a very hot, preheated grill, cover and cook for 1 minute. The oysters should now be slightly open. Quickly remove the oysters. Hold an oyster with an oven mitt and use a shucking knife (or a clean screwdriver if you don't have one) to pry open the oyster. It should easily open. 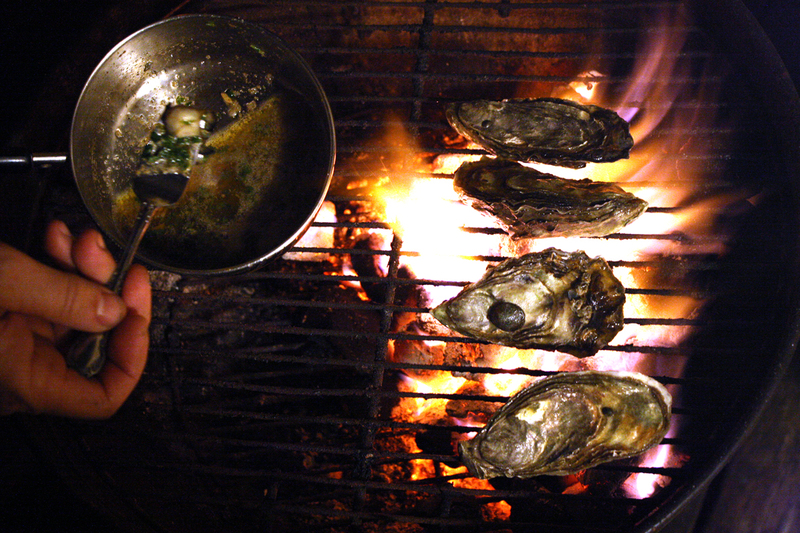 Spoon sauce into each oyster and return oysters to the grill. Cover and grill 4-5 minutes.